Dental care can be costly and hard to access, especially if you live in a rural community or a third-world country. In fact, the biggest barrier to dental care is cost. This is according to the American Dental Association, which says many rural areas lack access to dental professionals. Other than the obvious aesthetic benefits of straighter teeth, orthodontics has legitimate health benefits. According to the American Association of Orthodontics, proper teeth alignment contributes to the development of a healthy bite. Properly aligned teeth are also easier to clean, which helps prevent plaque, bacteria buildup and cavities. Meanwhile, improperly aligned teeth can also wear down your enamel and contribute to teeth loss. As it turns out, 65 percent of the population could benefit from orthodontic treatment, according to a study from the National Health and Nutrition Examination Survey. But in terms of those who get treatment, it’s more frequent in higher income groups. The cost of braces and invisible aligners — those clear, mouthguard-like pieces of plastic — varies, but treatments can range from $4,685 to $6,500 for adolescents, and adult treatments can cost up to $7,135, according to a 2013 American Dental Association survey. Last year, the orthodontics market saw $11 billion in revenue, according to market research company IBISWorld. It’s also worth noting that a number of Invisalign-maker Align Technology’s patents around the planning phase of clear aligners expired last year. It’s no surprise, then, that a handful of venture-backed startups are now vying for the opportunity to straighten and whiten your teeth. Similar to Uber and Lyft’s effects on the taxi industry, these orthodontics startups could potentially upend a hundred-year-plus-old industry and change how we access dental care. For those who can’t afford braces or Invisalign, startups like Uniform Teeth, Candid, SmileDirectClub and Orthly aim to not only reduce the cost of clear aligners, but also the number of visits to the orthodontist — with some even cutting out the in-person orthodontist visit altogether. The rationale behind many of the startups that have popped up over the years comes down to accessibility and cost. Uniform Teeth, which launched the first week of this year, is one of a handful of technology-driven startups that have popped up in recent years to get inside your mouth. Uniform Teeth costs $3,500, and offers treatment that is most similar to the experience of seeing a traditional orthodontist in a traditional setting. Before any treatment begins, Uniform Teeth requires you to come into its office to meet with its licensed orthodontist to get X-rays, scans and a dental health exam. What differentiates Uniform Teeth from the traditional orthodontics experience is that Uniform Teeth does not require ongoing in-person visits. Instead, after their first sessions, patients check in with their orthodontist via the mobile app every week. For the last visit, patients come in to ensure the treatment is going well and that no refinements are needed. Uniform Teeth was co-founded by Dr. Kjeld Aamodt, a certified orthodontist, member of the American Association of Orthodontists and teaching professor at the University of California San Francisco. The startup’s intent is to make orthodontics more affordable and accessible. 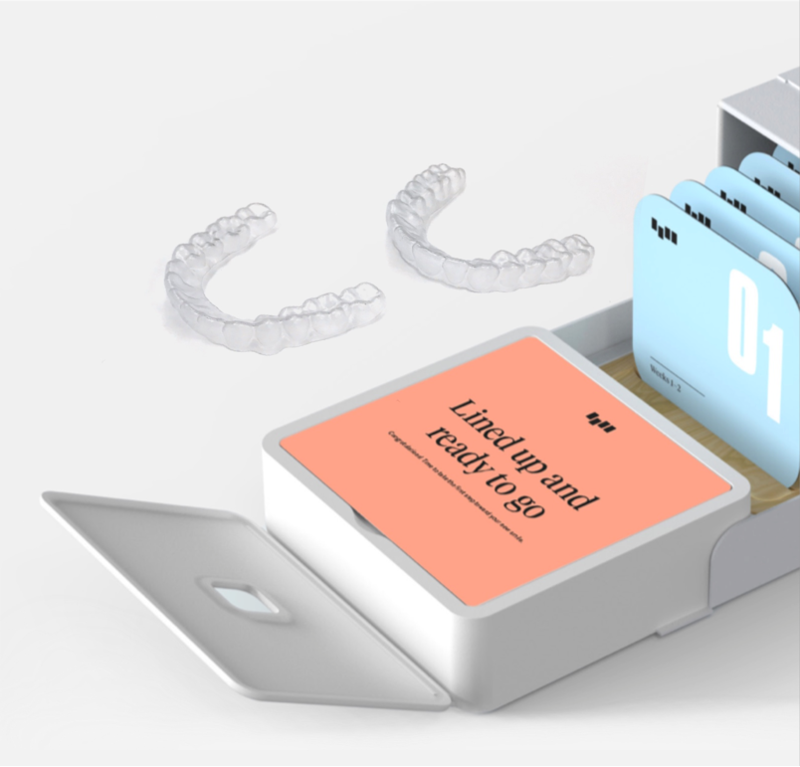 Another startup is Candid, which virtually connects patients with local orthodontists and then enables those orthodontists to prescribe direct-to-consumer aligners. Candid entered the market last September, with its 3D-printed aligners. Candid CEO Nick Greenfield described it to me as being for people who need mild-to-moderate orthodontic work. Candid costs $1,900 upfront or $88 per month over two years, while braces can cost up to $7,000 and Invisalign can cost up to $8,000. Candid, which raised a $15 million Series A round last November, has a three-step process to straighter teeth. First, the company sends patients a modeling kit, so they can take teeth impressions at home. After patients send their impressions to Candid, its orthodontists review them to ensure Candid can treat their case. If Candid’s orthodontists decide your case is more severe, meaning it might require some teeth extraction or other procedures, they’ll suggest you go into an orthodontic office. Similar to Uniform Teeth, Orthly requires an initial in-person visit. Unlike Uniform Teeth, though, Orthly does not have its own orthodontists. Instead, Orthly connects patients with orthodontists in your area. While Candid, Uniform Teeth and Orthly are all newer entrants, SmileDirectClub has been around since 2014. Over the last year, however, SmileDirect has made headlines as a result of the American Association of Orthodontists objecting to the way it markets itself and other violations. SmileDirectClub is a direct-to-consumer teeth aligner startup that started with the idea of using teledentistry to virtually connect licensed dentists and orthodontists with people who want to straighten their teeth. Since its inception in 2014, SmileDirectClub says it has helped more than 100,000 people straighten and brighten their teeth. The company ships invisible aligners directly to customers, and licensed dental professionals (either orthodontists or general dentists) remotely monitor the progress of the patient. Before shipping the aligners, patients either take their dental impressions at home and send them to SmileDirectClub or visit one of the company’s “SmileShops” to be scanned in person. SmileDirect says it costs 60 percent less than other types of teeth-straightening treatments, with length of treatments ranging from four to 14 months. The average treatment lasts six months. The AAO asserts that SmileDirectClub violates the law because its methods of allowing people to skip in-person visits and X-rays is “illegal and creates medical risks.” The organization has also filed complaints against SmileDirectClub in 36 states, alleging violations of statutes and regulations governing the practice of dentistry. Those complaints were filed with the regulatory boards that oversee dentistry practices and with the attorneys general of each state. With any old-school market disruptors, there are bound to be naysayers. Orthodontic treatment is not a product, but rather “a complex medical process that moves biological material, and is best done under the direct supervision of a licensed professional,” Dillard said. The AAO also notes that all orthodontists are dentists, but only 6 percent of dentists are orthodontists. SmileDirectClub, however, maintains its focus is on the customer and that “certain organizations” simply see the company’s model as a threat to its bottom line, SmileDirectClub co-founder Alex Fenkell told TechCrunch in an email. SmileDirectClub has a partnership with Align Technology to manufacture a fraction of SmileDirectClub’s aligners. In 2016, Align Technology invested $46.7 million in SmileDirectClub and invested another $12.8 million in 2017 to own a total of 19 percent of the company. 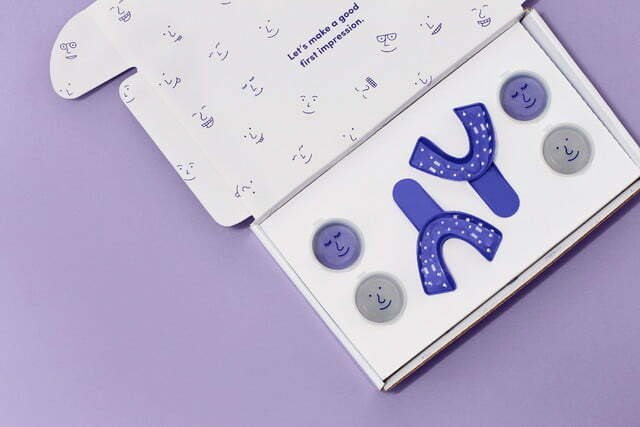 Align also noted that, in the event SmileDirectClub cannot take a patient, the startup refers the patients to an Invisalign provider for in-office treatment. While the U.S. Food and Drug Administration has approved Invisalign for in-office treatments, it has not cleared or approved any over-the-counter clear aligners, an FDA spokesperson told TechCrunch. The FDA does not confirm, comment or deny any pending applications. In order to ensure it doesn’t wind up in a similar or worse position SmileDirectClub found itself in last year, Candid says it has a strict requirement around what is needed from its customers in order to service them. For one, Greenfield stresses that Candid only takes mild to severe cases. Candid also requires that the patient has seen a dentist in the previous six months. While Candid says it has not had any conversations with the AAO chairman or anyone at the highest-ranking level, Greenfield says his conversations with other folks at the organization have been positive. Unlike SmileDirectClub, AAO has not taken a public stance on Candid, Uniform or Orthly, Dillard said. However, Dillard noted the AAO “has long held the position that it’s in the best and safest interest of the public to have orthodontic treatment conducted under the direct and ongoing supervision of a licensed orthodontist. Candid has orthodontists on board from every state in the U.S., except North Carolina because of regulatory reasons. If the orthodontist decides your case is mild or moderate, they’ll create a treatment plan for you and send you a 3D model of what your teeth will look like. Although Candid itself is not approved by the FDA, Candid says it’s working with a manufacturer that has 510(k) clearance, which means it has demonstrated to the FDA a certain level of safety and effectiveness. That means once Candid receives the impression from the patient, the company converts that into a 3D file that then goes off to the manufacturer. The manufacturer then turns that into a plan, with the purchase coming from an orthodontist. All of these startups work with licensed dental professionals. At the end of the day, it’s about going with the solution that feels best for you. Getting orthodontic treatment can be costly and it’s not always accessible, depending on where you live. What these startups do is offer an alternative to people who can’t afford the traditional methods and may not have time to go to in-person office visits over the course of several months. This is where the promise of tele-health comes in, which enables patients to check in with their orthodontists via mobile apps, sending them pictures of their teeth and other relevant information. “It’s going to expand the market dramatically and it’s going to offer this kind of service to a whole population that [traditional orthodontics] is just too expensive for and take it from a really high-end cosmetic sort of thing to a mass market that is going to improve people’s lives and better society,” Elton said. Cyan Banister of Founders Fund has also made a bet on teeth-straightening startups. Instead of Candid, she went with Uniform Teeth, saying the company’s approach is different from the rest. 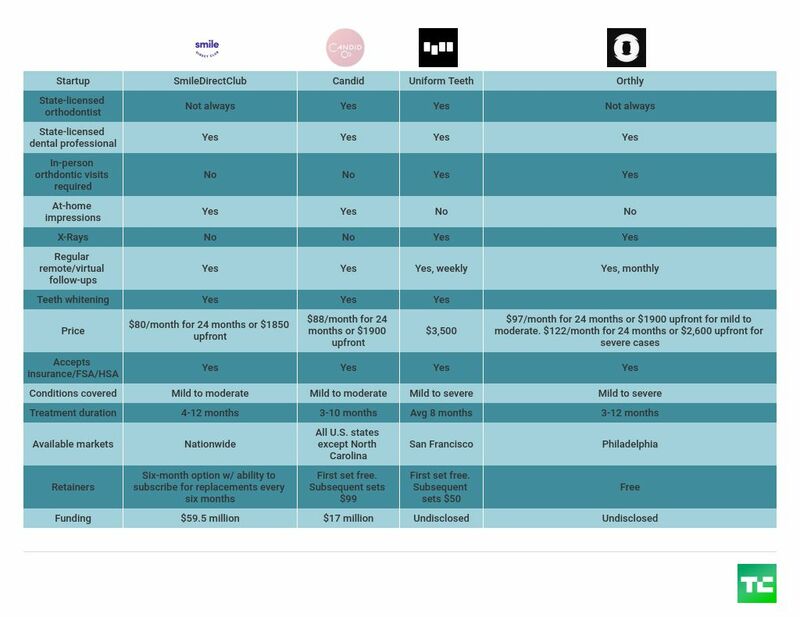 With the handful of clear aligner startups out there, it’s too soon to say which model is best. And, perhaps, similar to Uber and Lyft, it doesn’t need to be a winner-takes-all market.